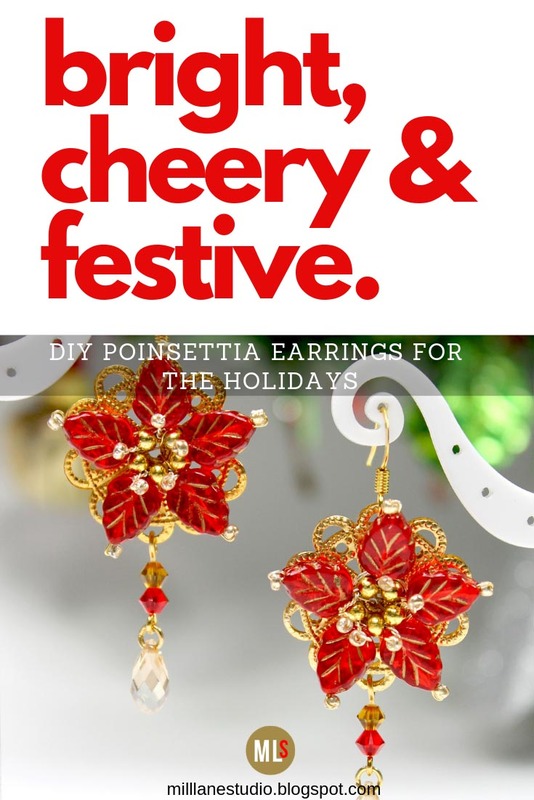 It's hard to miss the showiness of the poinsettia at this time of the year. 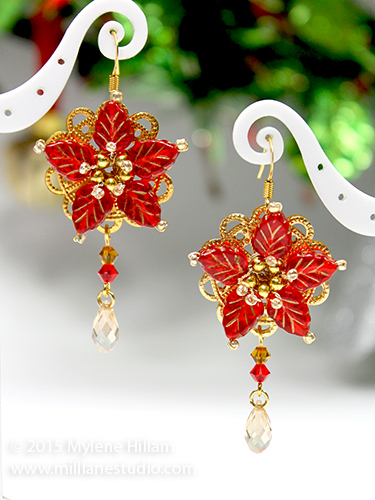 With their vivid red bracts and deep green leaves, it's no wonder that they are associated with Christmas. Even in the southern hemisphere where we are in the middle of summer, we are able to decorate with the traditional Christmas Eve flower thanks to the very clever nurserymen who know how to coax them to flower in the height of summer! In honour of these flamboyant blooms, I've made an equally showy pair of earrings for Day 6 of the Twelve Days of Christmas Earrings Extravaganza - Poinsettia Magic. 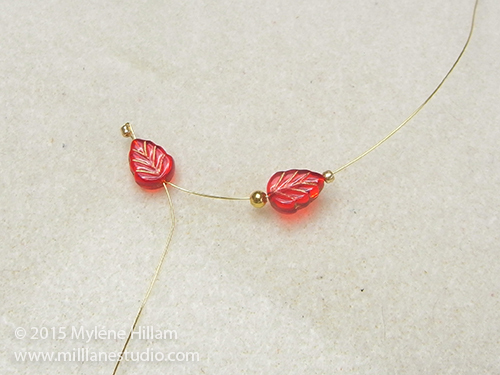 Cut 38cm (15") gold wire and string a leaf bead (from the base) and a seed bead and slide them along to within 10cm (4") of the end of the wire. 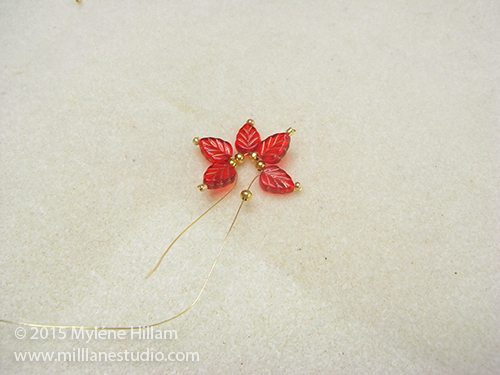 Thread the wire back through the leaf bead. Pull the wire up tight. 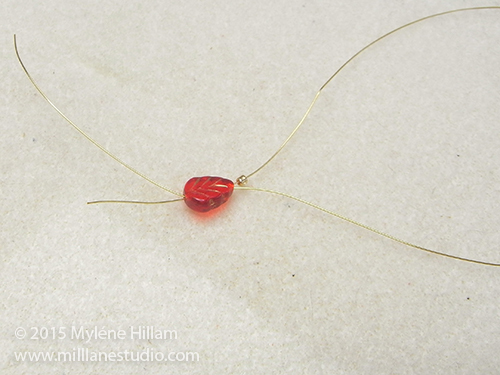 String a gold spacer bead, another leaf and a gold seed bead on the long end of the wire. 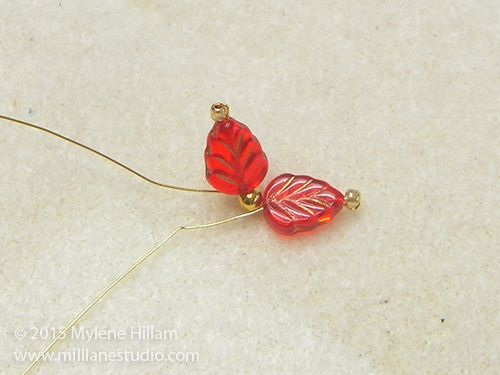 Thread the wire back through the leaf bead, slide the spacer and leaf right down to the first leaf and pull the wire to tighten the seed bead in place. Continue adding spacer beads, leaf beads and seed beads in this manner until you have added five leaves. 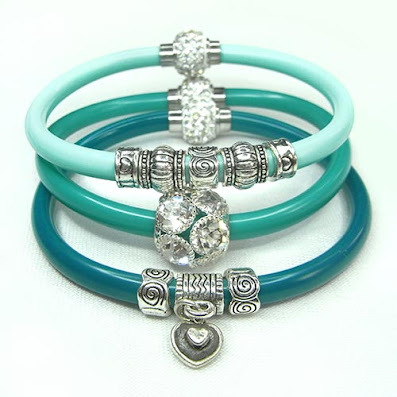 String a spacer bead. Form the leaves into a circle to form the poinsettia. 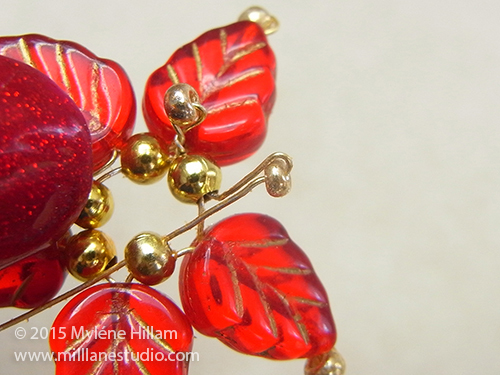 Insert the wire into the next spacer bead and pull it up tightly. 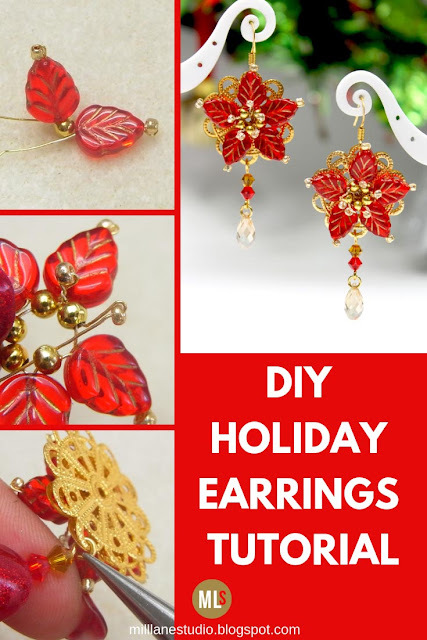 String a seed bead and slide it along to approximately 8mm (5/16") from the spacer bead and insert the wire into the next spacer bead. 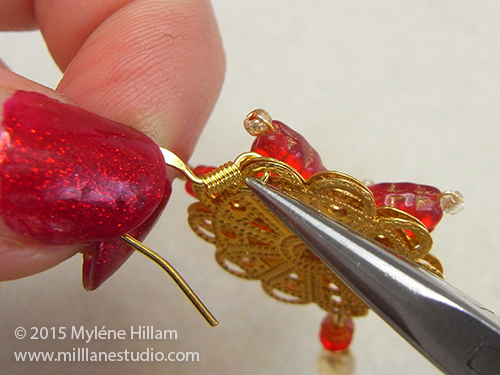 Grip the wire below the bead and twist it several times. 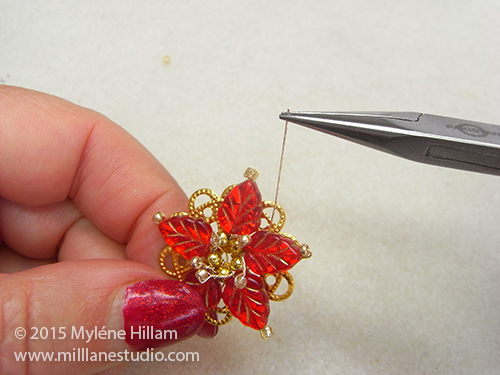 Continue adding seed beads and twisting the wire until you have created 5 stamens. 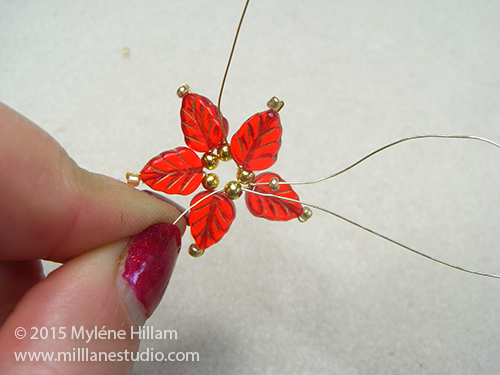 Wire the poinsettia to the filigree by weaving the wire in and out from the poinsettia to the filigree. 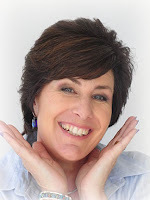 Use the pliers to help you pull the wire up tight. 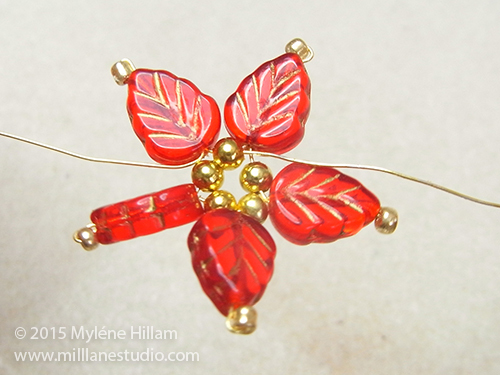 Neatly wrap both wires around the space between the poinsettia and the filigree. 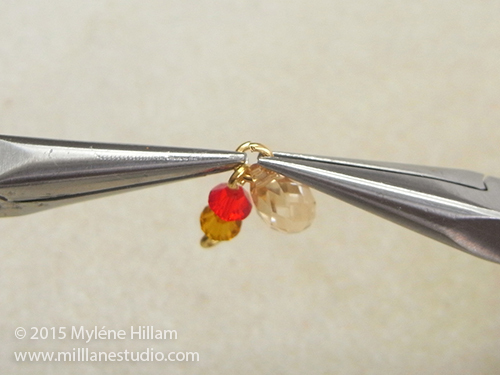 String a Lt Siam and a Colorado crystal on an eye pin. 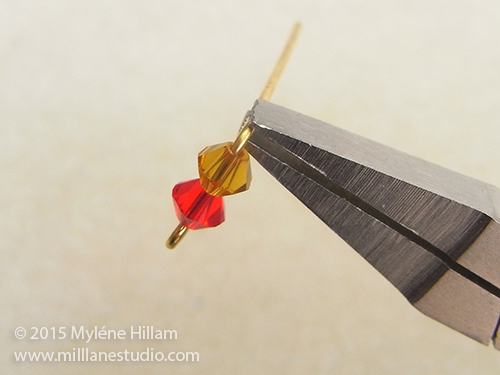 Bend the eye pin at a 90° angle. 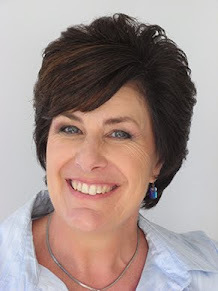 Trim to 1cm (3/8"). 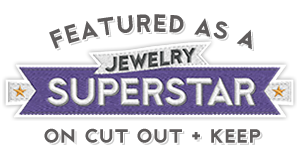 Open a jump ring and hook on a briolette. 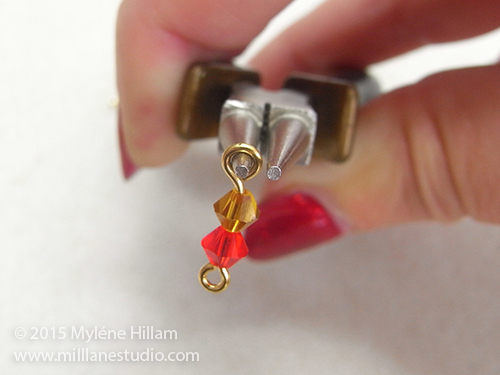 Before closing it, attach the eye pin. 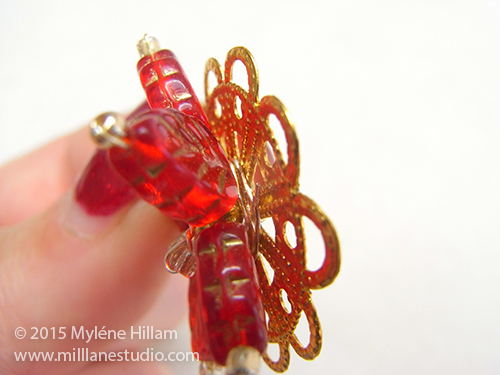 Place a second filigree on the back of the first to cover your wire weaving. 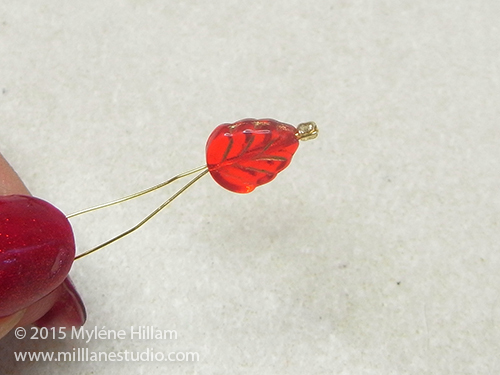 Open the other loop of the eye pin and hook it through the two filigrees. 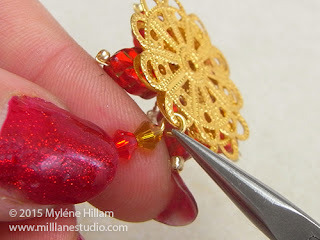 Open the loop of the earring wire and hook it through the opposite side of the filigree. 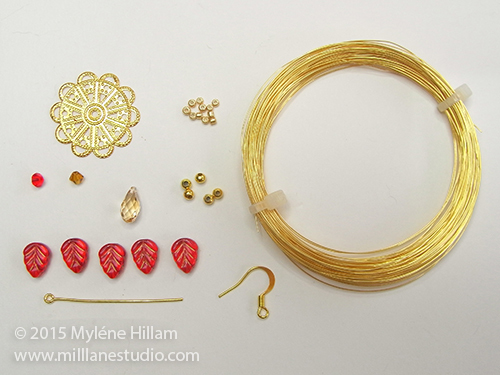 Make a matching earring with the remaining components. 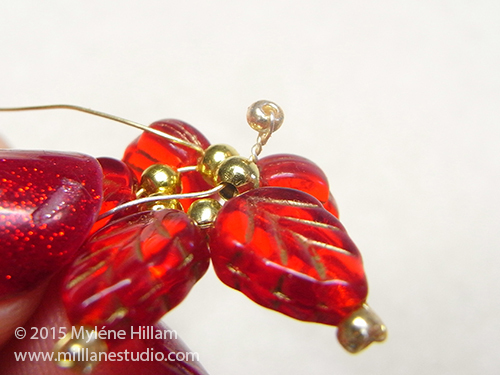 You'll find this design in Volume 4 of The Twelve Days of Christmas Earrings ebook. 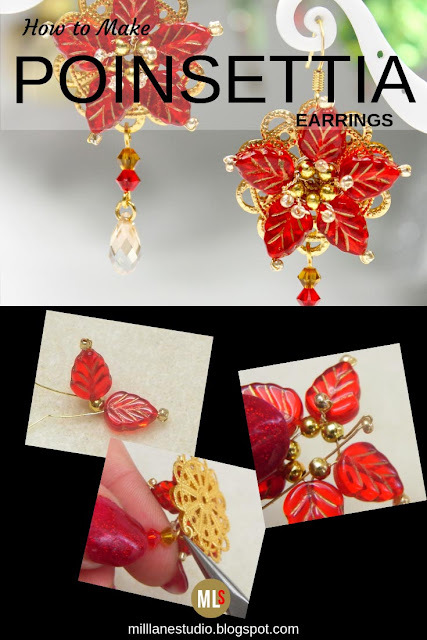 The book features 12 unique and origianl festive earring designs with clear photos and step-by-step instructions in a printable format and it's available for immediate download after purchase. If you like this project, then Pin it!